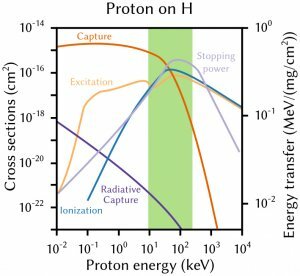 So far, ion-ion collisions in atomic physics were performed mainly in the context of magnetically confined plasmas using crossed beam devices in the low-energy domain where electron capture is the dominant process. 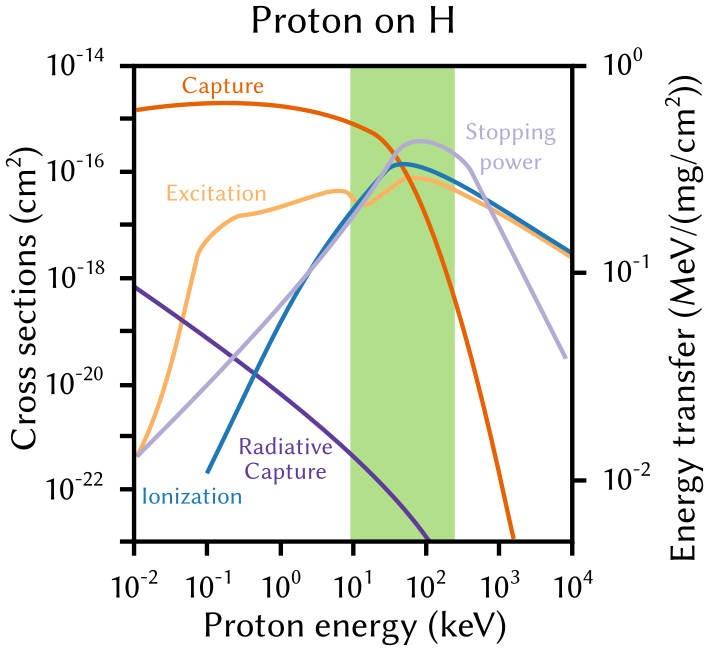 Measurements and reliable theoretical predictions are completely lacking for fast ion (MeV/u) slow ion (keV/u) collisions, a regime in which ion energy transfers are at its maximum, and where all the primary electronic processes (electron capture, -loss and -excitation) reach their maximum. Schaubild 1 : Ion-ion collision regime for different theoretical approaches compared to the regime reachable by FISIC. 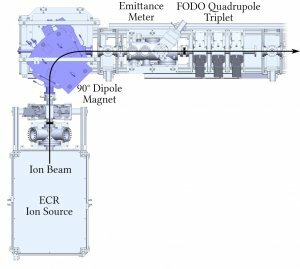 To fill in the blanks, a new ion-ion collision experiment, the FISIC project (Fast Ion Slow Ion Collisions), a mobile experiment being able to conduct crossed beam ion-ion collisions at different high energy ion beam facilities is developed. The FISIC collaboration involves groups from CiMap (Caen), GSI (Darmstadt) and iOQ (Jena) which collaborate under Project-ANR-13-IS04-0007 and GANIL (Caen) under CPIER Contract 2015-2025. 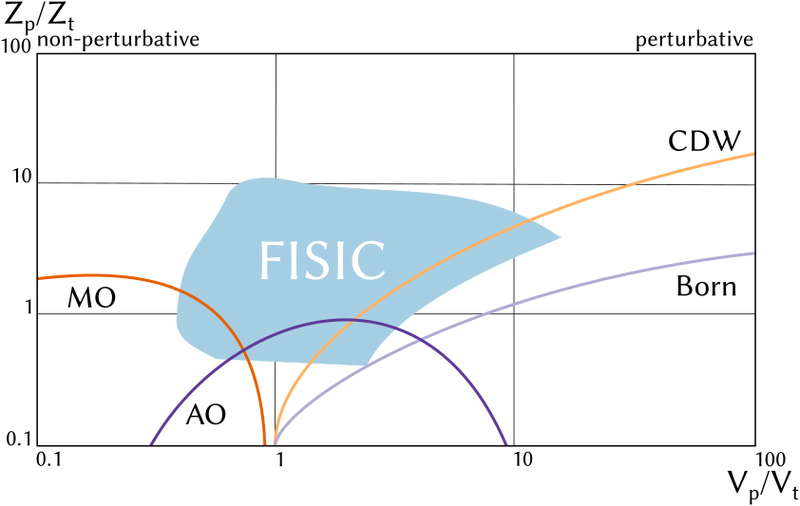 Schaubild 2 : Ion-ion collision regime for different theoretical approaches compared to the regime reachable by FISIC. 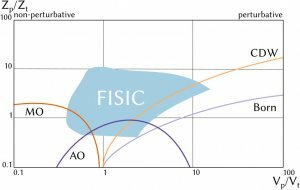 The FISIC experiment can be divided into two parts : The high energy ion beam line and the high energy ion beam line. While the high energy ions will be provided by specialised institutes such as GSI and GANIL, the low energy ions will be provided by a mobile beam line especially constructed for this purpose. This beamline consists of four parts, which will be described in the following. Before experiments with an ion beam can be conducted the beam has to be produced and accelerated. We are utilizing a commercially available PANTECHNIK SUPERNANOGAN ECR ion source from which ions are extracted with an energy up to 20 qkeV. After acceleration the ion beam is mass to charge selected in a 90° dipole magnet. Following the magnet an emittance meter is installed to easily monitor the beam size and divergence. Before entering the next beamline section the beam passes a electromagnetic quadrupole triplet for beam focussing. Several differential pumping stages are included in the beamline to reduce the vacuum pressure from around 1e-4 mbar in the source to 1e-10 mbar before the charge state purification system. 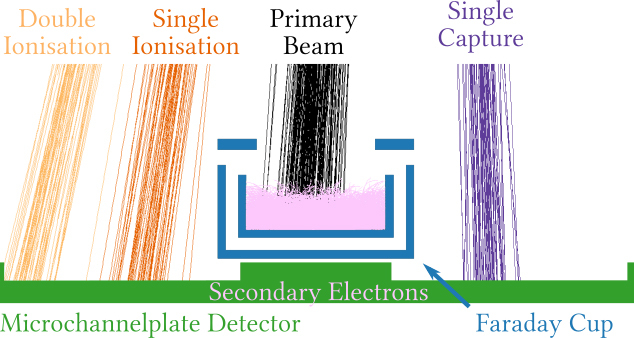 Since especially highly charged slow ion beams can undergo significant charge exchange scattering with the residual gas molecules it becomes necessary to insert a second charge state selection system close to the experimental area. For low energetic ion beams it is convenient to utilise electric fields for this purpose. To maintain the axis of propagation of the ion beam an omega shaped purification system consisting of four 140° cylindrical deflectors is installed. Different charge states with the same kinetic energy have different trajectories inside the structure so that ions which underwent ionisation or capture in residual gas collisions can easily filtered out with beam apertures cutting away the outer beams. Focussing of the beam is achieved by the element Einzel lenses at the beginning and the end of the structure as well as due to the intrinsic focusing of the cylindrical deflectors in the plane of deflection. For additional focusing perpendicular to this plane matsuda electrodes are installed on top of the deflectors, which are not shown in the schematic graphic. In this chamber a vacuum better 1e-10 mbar should be achieved. In principle the crossing and therefore interaction of the ion beams could be carried out directly in empty space. To be able to practice energy tagging and differentiate between products from the ionion interaction and from ion-residual gas interaction a high voltage box can be inserted at the crossing point. 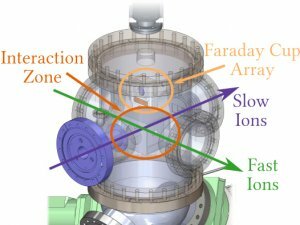 To furthermore measure the size and distribution of the low energy ion beam, a Faraday Cup array can be moved to the same position. This information is needed for calculating absolute reaction cross sections. 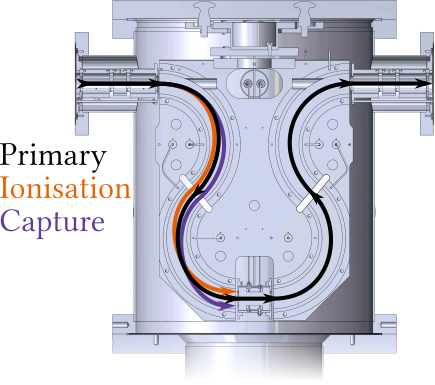 In case the experiment is installed at different user facilites, both elements can independently frome each other totally retracted from the beam line to improve vacuum and not to interfere with other experiments. 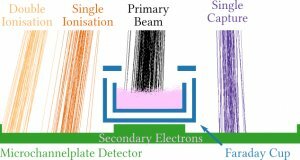 The detection of the product ions due to the collision of the two beams has varies slightly for the high- and low-energy ion beam. 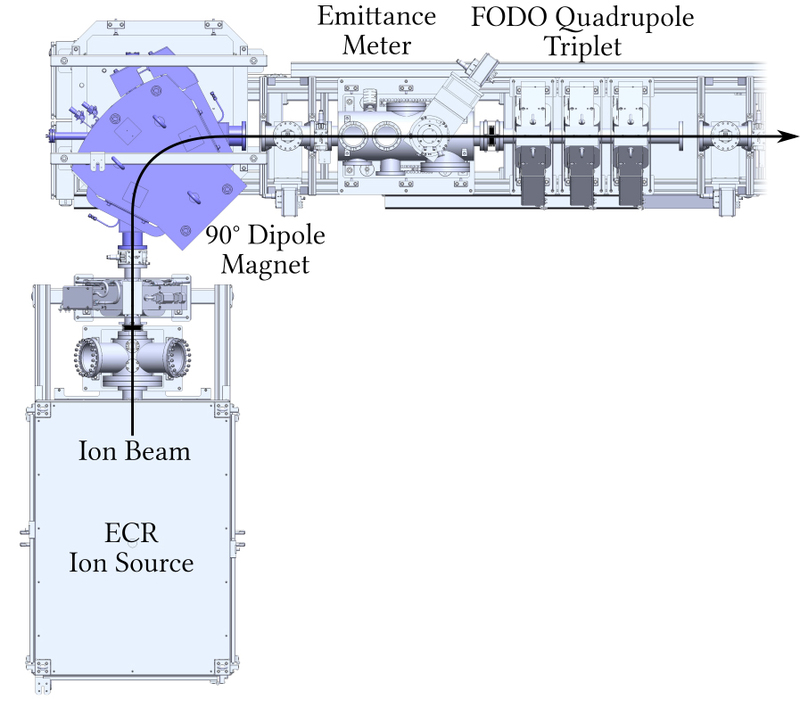 The separation on the high energy ion beam occurs naturally in the next magnetic dipole following the collision chamber. 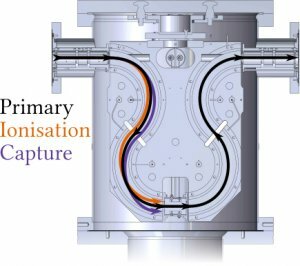 By placing suitable detectors at the right position in the dipole chamber the products can easily be detected. For this purpose we are using scintillation detectors developed at iOQ Jena and converter plate channeltron detectors developed at the JLU Giessen and GSI Darmstadt. To separate the product ions on the low energy beamline, a 90° electrostatic cylindrical deflector system is used. For detection, two different approaches are used. The high intense primary beam is detected by a standard Faraday Cup. Next to it a commercially available position sensitive microchannelplate detector is placed to detect the way less intense product beams.